It’s 1 a.m. and I’m sound asleep in bed when I hear a big boom. I’m startled awake, so I jump up, grab my robe, and run onto our giant balcony that overlooks the Mediterranean Sea. Directly in front of me the moon is shining bright and sparkling off the water. I look around quickly to find the source of the noise, and to my right a big, beautiful rocket soars into the sky and bursts into thousands of little lights. My husband and our two guests stir from their beds and join me on the balcony, as light fills the sky. It’s magnificent. “This would never happen in North America!” shouts my friend. It’s hard to hear over the thunderous noise, so I nod my head and smile. There are a lot of things that happen in Spain that would never happen back home. Like the world’s largest tomato fight, running with the bulls, or shooting a huge display of fireworks in the middle of the night. Lucky for me, I don’t have to be up in the morning because I work from home and I make my own schedule. A true gift when you live in a place that is full of pleasant surprises. Tonight, this fireworks display marks the end of the largest festival in my new home of Sitges: Fiesta Mayor. It’s a week-long celebration filled with Catalan traditions that involve the entire community: young and old, male and female, and expats like me. One such tradition is called the sardana, a historic Catalan dance dating back to the 16th century. During this dance, a band with 10 wind instruments called a cobla plays a the traditional sardana song, while the community circles together, holds hands, and steps to the music in unison. The steps aren’t hard, and everyone is welcome to join in. Another tradition dating back to the 18th century is the castel, a human tower where a team of castellers climb on top of each other to create different structures. The tower is considered complete when the smallest member of the team, usually a child, takes their place on top and raises one hand with four fingers erect. At that moment the crowd cheers loudly, but the show is not over. The castellers must descend from highest-to-lowest until they have all reached safety below. It’s an awe-inspiring performance that you can see at most Catalan festivals. 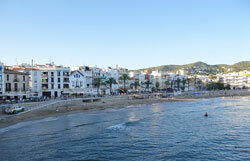 The seaside paradise of Sitges, Spain is beautiful and more affordable than you may think. Tonight’s festival, La Fiesta Mayor, was supposed to end a few days ago. There had been a big parade throughout the city, featuring gifted musicians, talented performers, folklore dancers, parading giants, and fire-breathing dragons. But here we are a few days later, surprised in the middle of the night by one last display of fire and light. It wasn’t published on a schedule. There were no announcements or warnings. But that’s ok! We’ve learned to savor each surprising moment because we live in a magical place. And you know what one of the biggest surprises has been? It is the low cost of living. We are able to afford this seaside paradise for much less than we would pay in the United States. Our full-coverage, no deductible, no co-pay health insurance plan is only about $70 per month per person, compared to $100 a month per person for a high deductible plan with co-pays in the U.S…our iPhone bill only costs about $10 per month, compared to about $150 per month back home…and this week I spent only $150 on groceries, including lots of fresh fruits and veggies, lean meats and cheeses, oven-baked bread and even household goods. A trip like that would have easily cost me $200 or more in Florida. Yes, living in Catalonia is magical—but it’s also quite affordable.